Indulge her sense of style with this dazzling 0.25ct diamond multi stone ring, styled with sparkling diamond set shoulders for extra dazzle. Crafted in sleek sterling silver. 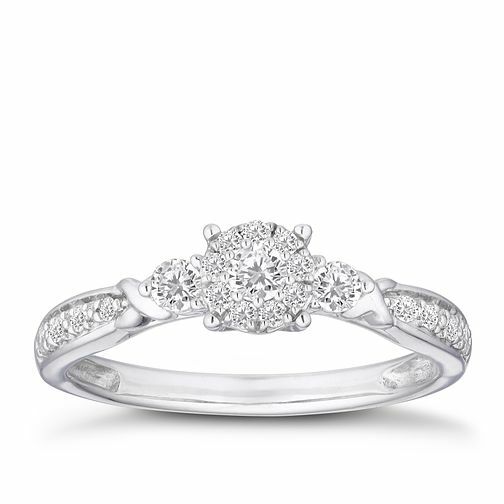 Sterling silver 0.25ct diamond ring is rated 5.0 out of 5 by 5. Rated 5 out of 5 by Anonymous from Great ! I bought this ring to propose to my girlfriend of 5 years. She is very particular when it comes to rings but I know that this is the one. The quality is great and the delivery was quick and easy.